This month marks the start of two fun new projects for me. The Star Light Star Dark Quilt Along with Jessica of Quilty Habit and Meadow Mystery, a mystery quilt with Cheryl of Meadow Mist Designs. Jessica’s Star Light Star Dark is an exercise in different values of the same color. She’s offering a 3-color lap quilt or 2-color baby quilt option for the quilt along. I’ve chosen the hybrid 3-color baby quilt. ;-) I started with purple, the most abundant color in my stash. I had a reasonably easy time pulling a variety of values of purple fabric. For my “second color” I struggled to find a range of values in any one color, so I decided to go with yellow and orange. This afforded me the ability to pull all the fabrics from my stash for this project. Yay! 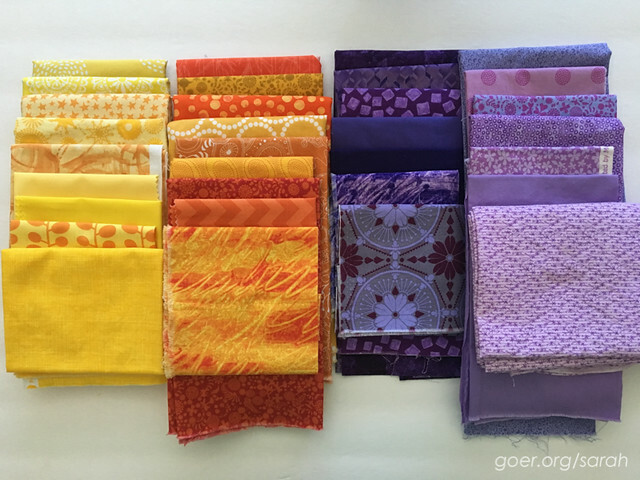 Below are my fabrics: light yellows/orange, dark yellow/oranges, dark purples, and light purples. You can better see the values in the black and white photo below it. This is my second online mystery quilt with Cheryl. I did the Midnight Mystery quilt last year. 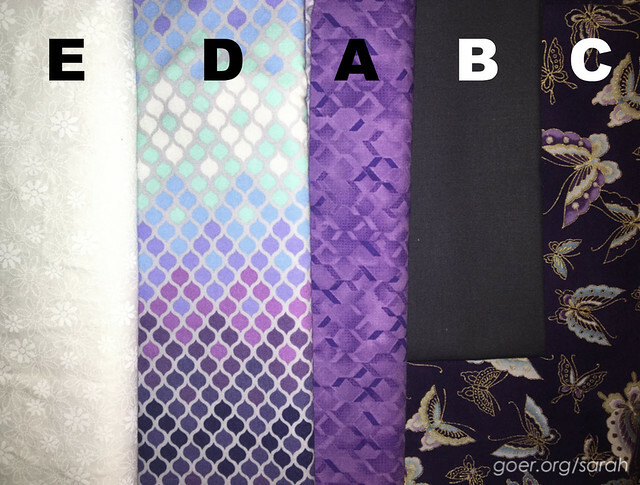 The requirements just came out for our five fabrics for the Meadow Mystery quilt. She indicated by value what we needed. Last year my colors and fabrics chosen for my quilt were both driven by my stash. Generally I stash half yard cuts of fabric, so I went scrappy to fulfill each color requirement. This year, I decided to pull fabrics from my larger cuts first, since those options are minimal in my stash. I picked the white tone on tone for my background fabric since I had a bunch of it from a project I decided to go another way on. 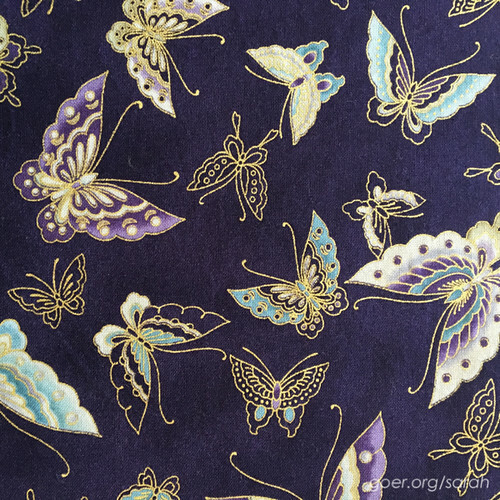 Then I chose the butterflies, which ironically, were a castoff from an earlier stage of that same old project, what became the Purple Ninjas quilt. This left me with needing a half yard of a medium value, and 1 yard each of a dark and a light to medium. I was able to find the other fabrics in my stash. I may need a bit more of the Kona solid than I have on hand. I’ll also pick up more of the multicolored print (Mosaic in Glacier by Tula Pink), since I really love it and I haven’t decided if I’ll try to fussy cut to avoid the darkest portions or not. For those of you participating in the mystery quilt, I’ve labeled my photos with the letters corresponding to the pattern. (Sorry they aren't in order.) :-) Once again, I have a black and white version of the photo below to better show the values of the fabrics. So much for working outside of my favorite color, but I’m excited to see how these project both shape up. Posted in Quilting on July 13, 2016 by sarah. There are so many factors to consider. You'll have to find another new project for your initial large cut! Thanks for visiting, Alison. I can't wait for cutting instructions. The thing about once a month is that it's a totally not overwhelming pace, but we have to wait so long! Thanks for visiting, Alison. Yellow AND orange together will make such a statement. You are so into the purples lately! Can't wait to see your mystery quilt, too! I really like the purple butterfly material. that really stands out!! Good luck with your project!! Thanks, Bo! I'm excited to finally be using it. My you have a lot of fabrics for the star light star dark project ...it will be very interesting. 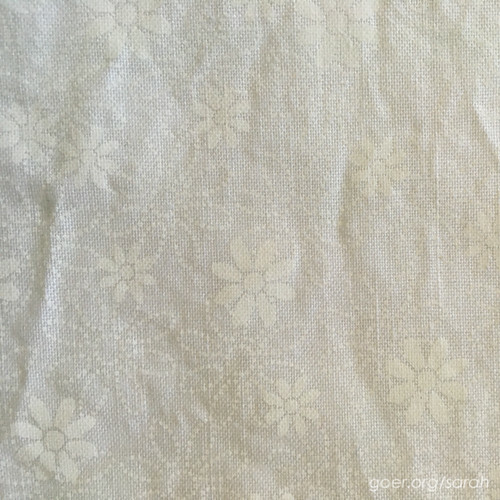 I love your Meadow Mist Fabrics, I'm interested in how the quilt will work out with this combo. I think Star Light Star Dark called for 6-7 of each set, so I do have a few extras. We'll see what doesn't make the cut as I go. And as for Meadow Mystery, I love a mystery quilt. It's so fun to watch it unfold. Thanks for visiting, Lisa. GREAT colors - will be fun to see how you put both of these quilts together. Thank you, Julie. I look forward to seeing them unfold.